A Florida native, Natalee was in the Marine Corps for two years and moved to the west coast while stationed at Camp Pendleton. Working in aircraft maintenance, Natalee was responsible for updating files and tracking the logs for each aircraft after maintenance was performed. After leaving the Marines, Natalee began working at a local grocery store where she met Isaac, who was also working at the store in security. The couple eventually moved in together and had their daughter Joy, who recently celebrated her first birthday. Following her daughter’s birth, Natalee went on unemployment and was referred to Interfaith for housing and nutrition assistance. 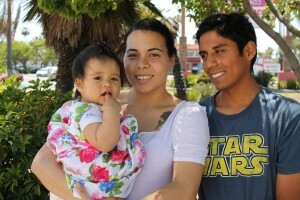 With the help of their case manager, the family soon moved into their own apartment in Oceanside. Since moving into their new home, Natalee, Isaac and Joy are enjoying their own one bedroom apartment in Oceanside. Isaac is employed at local biotech company and Interfaith supporter Genentech, and Natalee just earned her cosmetology license and will begin working in a salon soon. Natalie and her family’s journey is just one example of how the Housing 1000 program changes lives. To learn about how you can get involved and contribute to the campaign today, please contact Robert Adams, Chief Development Officer, at radams@interfaithservices.org or by calling (760) 489-6380 ext. 206.